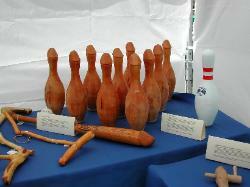 hands than to disrobe a bowling pin. end--mainly for my nudist friends. I have to carve these. Don't ask me why. the planet, maybe to me, I don't know. outside within view of the neighbor's windows. carve this piece of already defiled wood into a phallus. had ever carved. But with a lot of pressure it would give way to the rasp. After several hours of sweaty, grueling hard work, I had it done. Not bad! satisfied...and tired, but in a good sort of way. resolving not to carve them, but to just take the plastic off, that's it! Just…. well....just to have that plastic off, that's all! NO CARVING! project but to admire it...and figure out who I could show them to. stopped at the bowling alley one last time to get one more pin. They must have seen me coming. The woman at the desk called to the back and told the guy what I needed. saying he had two boxes set outside in back for me. Just pull around. right now. I thanked him and said that was fine. what I'm going to do with these two. up with a better idea. Ooooohhhhhhhh God, it feels so good. !